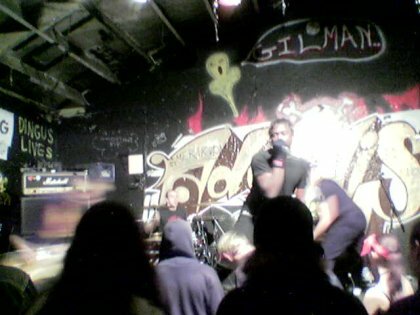 A lot less people went to the gig at Gilman last night than the one I went to last week - about 40 (not counting bands) by the end vs around 150 last week at a rough guess. Typical, gigs are on twice a week and you're spoiled. Things started off slowly but it was a really good gig. False Alliance started, then Instigator - both from Los Angeles. Instigator do a great show and gave everyone a free CD! Yes, everyone! Shadowboxer went on then, followed by Love Equals Death.